Beth T, age 42, is a Caucasian female with a 32-year history of type 1 diabetes and a 15-year history of Crohn’s disease. For the last 12 years, she has been using a continuous subcutaneous insulin pump; her most recent hemoglobin A1c value was 5.7%. When she arrives in the emergency department at 9 am with a possible GI bleed, her blood glucose (BG) level is 98 mg/dL. At 9:45 am, the attending physician removes her insulin pump and orders sliding-scale insulin with insulin lispro, a rapid-acting analog insulin. He also orders point-of-care BG testing before meals and at bedtime, a clear liquid diet, and a gastroenterology consultation. At 10:15 am, the gastroenterologist puts Beth on nothing-by-mouth (NPO) status and schedules a colonoscopy for the next day. When she arrives on your med-surg unit at 1 pm, you review the orders and feel relieved that her insulin pump has been removed, because you don’t know much about these pumps. You plan to check her BG at 6 pm—the next scheduled time. Continuous subcutaneous insulin infusion (CSII) pump therapy is an effective self-management tool for patients with diabetes. It has been linked to decreased hemoglobin A1c levels and improved satisfaction with diabetes self-management. More than 300,000 Americans currently use these pumps, so healthcare professionals are seeing more pumps in patients in hospitals and other healthcare settings. Unfortunately, many hospital-based clinicians lack knowledge of these pumps because they haven’t been educated about them or how to manage them. This knowledge deficit puts patients at risk for diabetes-related harm, such as DKA and hyperosmolar hyperglycemic syndrome (HHS). and creates the expertise needed to navigate potential problems. Thanks to this extensive patient education, some hospital patients may have more expertise in pump management than hospital clinicians. For hospital patients who are alert, oriented, and capable, the safest approach is to allow them to self-manage their pumps. Nonetheless, certain factors may make inpatient self-management less than ideal. The most important factor in safe pump management is an alert mental status; yet the physiologic effects of acute illness can alter the patient’s cognitive skills and ability to manage the pump. Clinicians must carefully assess hospital patients to determine their ability to self-manage the pump in the hospital; otherwise, an alternate insulin regimen may be warranted. This article enhances your knowledge of how insulin pumps work, describes assessment parameters, and discusses appropriate alternative insulin regimens. Traditional insulin pumps deliver insulin through a syringe and infusion set that consists of a small refillable syringe (reservoir) and tubing that connects the reservoir to the infusion set. The infusion set consists of an adhesive pad and a cannula that rests in the subcutaneous tissue. The infusion set is disposable and can be used for 48 to 72 hours. Two companies manufacture tubeless pumps, which use a pod with an internal pumping mechanism and an insulin reservoir to deliver insulin. Completely disposable, the pod attaches to the skin with an adhesive pad. Some patients find the tubeless system easier to manage because they don’t have to wear the pumping portion of the CSII, so the pump is less bulky and less visible. Also, people with active lifestyles or physically demanding jobs may prefer tubeless pumps because they don’t have to worry about exposed tubing being pulled on and the catheter becoming dislodged. The two types of insulin pumps have advantages and disadvantages. In the hospital, all insulin pumps must be removed for radiographic procedures. With the traditional pump, the reservoir and tubing detach completely from the infusion set; the infusion set can remain in place during radiographic procedures because it doesn’t contain materials that pose a risk. With a tubeless pump, materials in the pod could pose a risk during radiographic procedures, so the pod must be removed. Pods are completely disposable and can’t be reused; this can lead to wasted supplies if the patient requires repeated radiographic tests. Rapid-acting analog insulins are the most commonly used insulin in pumps. These insulins (lispro, aspart, and glulisine) mimic the body’s natural endogenous insulin, with an immediate onset (5 to 15 minutes), 1-to-2 hour peak effect, and duration of 3 to 4 hours. Although not approved for use in pumps, regular U-500 insulin (discussed in detail later in this article) is being used in pumps by patients who are highly insulin-resistant. Regular U-100 insulin, intermediate-acting insulin, long-acting insulin, and mixed insulins aren’t recommended with insulin pumps because of their pharmacokinetic complexity. Basic settings programmed into insulin pumps include the basal rate, carbohydrate ratio, insulin sensitivity factor, and target BG. Normally, the body produces insulin in response to gluconeogenesis, a process called basal insulin production. The body needs a continuous insulin source to allow glucose-dependent cells, such as those in the neurologic system, to function regardless of nutritional status. When the pancreas can no longer produce enough insulin to metabolize glucose properly, basal insulin must be replaced by an external source. Insulin pumps provide this continuous source through the basal rate. The pump’s basal rate constitutes roughly 50% of the total daily insulin dose. It can vary throughout the day in some patients, requiring multiple basal rates to be programmed into the pump. The ability to individualize basal settings throughout the day is one of the benefits of insulin pump therapy. When we eat, the pancreas releases an insulin bolus in response to the amount of carbohydrate consumed. This bolus allows the body to use food for energy. The carbohydrate ratio setting on the insulin pump mimics this physiologic function. It’s programmed into the pump to deliver 1 unit of insulin for a given amount of carbohydrate. A common insulin-pump carbohydrate ratio setting is 1:15, meaning 1 unit of insulin is delivered for every 15 g carbohydrate. 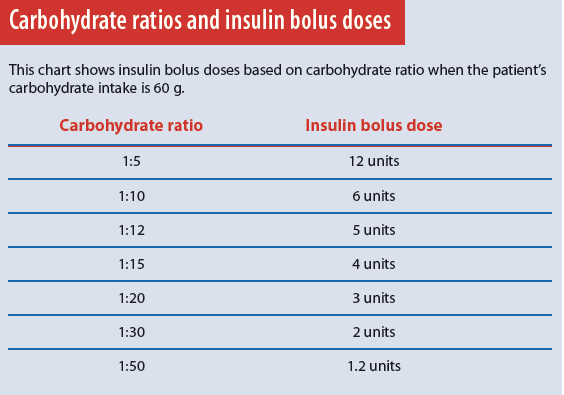 If the patient eats a meal containing 60 g carbohydrate, the pump delivers a bolus of 4 insulin units. The carbohydrate ratio also depends on the patient’s insulin sensitivity; typically, the more sensitive the patient, the higher the carbohydrate ratio. Very insulin-sensitive patients may have a carbohydrate ratio of 1:20 or 1:30, resulting in a lower insulin dose for the same amount of carbohydrate. Under normal circumstances, the body secretes enough insulin to keep the BG level below 140 mg/dL. But in diabetes, the pancreas secretes too little insulin to bring BG into a normal range. People with diabetes need additional insulin to return BG to an acceptable range; this additional insulin is called correction insulin. Administering correction insulin with a pump requires two types of information—desired (target) BG and quantity of insulin needed to achieve the desired result (insulin sensitivity factor). Determining target BG and insulin sensitivity can be complex and, as with all pump settings, it must be individualized for each patient. Not everyone with diabetes responds to insulin the same way. Certain comorbidities and hormonal fluctuations can cause unpredictable insulin sensitivity. Thus, 1 unit of insulin may lower BG by 10 mg/dL right now, but the same dose given to the same patient at another time may cause a 20-mg/dL change in BG. (See Blood glucose targets and predictability.) This unpredictability increases hypoglycemia risk. With all patients who have diabetes, a top priority is to achieve glycemic control as close to a normal range as possible while avoiding hypoglycemia. Those with an unpredictable insulin response require broader BG targets to reduce hypoglycemia risk. Insulin sensitivity indicates how much 1 unit of insulin lowers a person’s BG (in mg/dL); usually, this number ranges from 10 to 60 mg/dL. Insulin-resistant patients have lower sensitivity factors. The insulin sensitivity setting determines how much correction insulin the patient should receive. The resulting insulin dose is inversely proportional to the sensitivity factor; a high sensitivity factor necessitates a low insulin dose and vice versa. The “Rule of 1500” helps determine the insulin sensitivity factor when insulin-pump therapy is initiated. To calculate sensitivity, divide 1500 by the total daily insulin dose the patient will receive from the multiple daily injection (vial and needle) regimen; include all basal and bolus doses. For example, a patient who receives a total daily dose of 50 insulin units has a sensitivity factor of 30 (1500 ÷ 50 = 30). To correct a high BG, you must program the target BG and insulin sensitivity factor into the pump. Typically, target BG is a range—for instance, 100 to 140 mg/dL. Pumps made by different manufacturers may differ in how they use the target range. For example, one pump may aim for the target’s midpoint; another, for the target’s endpoint. As a result, slightly different insulin doses may have the same target range and sensitivity. Like other settings, target BG is highly individualized. For adults, the starting point for target BG is based on recommended goals set by the American Diabetes Association, along with goals the patient had while on a multiple daily injection regimen. Targets are adjusted according to patient response. Well-controlled patients with a more predictable response may have a target range that’s lower and narrower than that of patients with advanced disease, whose insulin response may be less predictable. The most important factor to consider with an insulin pump is the human factor. Even the most sophisticated insulin pumps require patient interaction and decision-making. Candidates for insulin pumps must be selected carefully; potential candidates are patients with type 1 or type 2 diabetes who are on multiple daily insulin injections. The ideal insulin pump user is a patient who successfully and consistently follows a multiple daily injection routine, checks his or her BG levels as appropriate, injects insulin as prescribed, and seeks to enhance positive self-management behaviors. Insulin pumps may be inappropriate for patients with undesirable self-management behaviors—skipping BG checks, poor eating habits, and incorrectly estimating carbohydrate intake. Such behaviors are likely to persist and can lead to poor glycemic control, regardless of how sophisticated the insulin pump is. Patients must understand that managing an insulin pump may be more complicated than injecting insulin several times daily and isn’t a cure for poor BG management. Patients using insulin pumps have varying levels of knowledge of CSII therapy. All patients using pumps should be taught how to make minor adjustments to their pump settings when ill or taking medications that affect BG. Yet not all of them receive this level of education. Patients with advanced education know how to override pump settings; such high-level skills are taught only to patients who have mastered basic skills and are ready for advanced techniques. Determining if your patient has advanced education helps the hospital team optimize glycemic control. hypoglycemia. However, this isn’t considered a best practice. Patients admitted with insulin pumps must be assessed carefully on admission. Ideally, they should be able to self-manage their insulin pumps in the hospital. But self-management isn’t appropriate for every patient. they are able to manipulate the pump physically to deliver bolus doses. How often do you check your BG? What types of boluses are programmed into the pump? What basal rates are programmed? What carbohydrate ratio is programmed? What is your target BG? What is your insulin sensitivity? Also find out if the patient performs all pump-management tasks independently. If not, begin an alternate insulin regimen, as ordered, and remove the insulin pump. In addition, consider an alternate insulin regimen for a neurologically impaired patient or one with weakness or pain that affects manual dexterity. Mental health issues also may pose a barrier to pump use. Patients admitted for suicide watch, psychiatric evaluation, or drug or alcohol overdose could cause self-harm if they’re allowed to self-manage their insulin pump. For instance, an excessive bolus may cause hypoglycemia; an insufficient bolus may cause hyperglycemia or DKA. These patients should be placed on an alternate insulin regimen instead. Finally, patients admitted for DKA or HHS shouldn’t continue on the pump; as ordered, start insulin therapy according to your facility’s DKA and HHS protocols. If the patient will continue to use the pump while in the hospital, ask if she or he brought pump supplies, such as infusion sets and insulin. Because several different CSII devices are available, most hospitals don’t stock infusion sets; the patient needs at least one infusion set for every 3 days of the anticipated hospital stay, plus one additional set for unplanned or accidental removal. The patient also needs an adequate insulin supply. Many hospital pharmacies can’t supply patients with insulin for their pumps because they may have only one brand of rapid-acting analog insulin on formulary. If the patient doesn’t have a supply of infusion sets or insulin, consider using alternate insulin therapy. Some hospital policies support the practice of patients supplying their own insulin for pump therapy. Be sure to familiarize yourself with your facility’s policies on pump supplies and pump management. The patient can review pump settings with you; you may want to write down the settings as the patient relays them to you. However, always review hospital policy regarding insulin pumps (if one exists) and document pump settings according to policy. Know that not all patients can find all the settings in their pumps; some have received only basic training. But this doesn’t exclude them from using the pump in the hospital. Always look at the big picture—the nature of the illness, medication regimen, and BG trends. For example, a patient admitted for a routine surgical procedure who maintains a stable BG level for the first 24 hours after surgery can probably stay on an insulin pump. On the other hand, someone admitted with an infection or inflammatory disease that requires corticosteroids could experience unstable BG levels; a patient with only basic pump skills may lack the knowledge required to adjust pump settings accordingly. In this case, consider an alternate insulin regimen. All hospital patients using insulin pumps must have their BG evaluated when you accept them into your care, whether they will continue pump therapy or switch to an alternate insulin regimen. A gap in care can occur if the patient is transferred from one unit to another around the time of a scheduled BG check. Suppose, for example, a patient has orders for a BG check at bedtime and is transferred just before that time. The receiving nurse might assume that someone on the transferring unit did the BG check—but don’t assume this happened. Instead, determine when the patient’s BG was last assessed and then recheck BG, if necessary. The medical team should review BG results and insulin use at least every 24 hours to determine if pump therapy is providing adequate glycemic control. Some hospitals require patients to sign waivers if they wish to continue managing their diabetes via insulin pump. settings the patient can access. In some hospitals, the electronic health record (EHR) has specific areas for documenting CSII information (including manufacturer and model, insulin type, multiple basal rates, carbohydrate settings, sensitivity, and target BG). Blood glucose monitoring must be performed on hospital equipment and documented in the EHR. At least once or twice per shift, assess and document insulin boluses and the integrity of the infusion set and surrounding skin. If the EHR lacks a specific place to document this information, record it in a narrative note. Ideally, hospital patients should be allowed to continue to self-manage their insulin pumps. But if the hospital team determines that removing the pump is the safest approach, an appropriate and adequate alternate insulin source must be established. Rapid-acting insulin, with a 3- to 4-hour duration, has a narrow window during which the patient has active insulin on board once the pump is removed. As time passes, active insulin is used quickly, leaving the patient vulnerable to markedly high BG levels. Very ill or dehydrated patients may develop DKA within 2 hours of pump removal. Frail or elderly patients with type 2 diabetes are at risk for developing HHS. The ideal alternate insulin source for critical-care patients is a continuous I.V. infusion that replaces the patient’s total daily insulin needs. To determine the infusion rate, divide the total daily insulin dose delivered by the pump by 24; this yields the hourly insulin infusion rate. Typically, these patients either are on NPO status or are receiving a continuous nutrition source that doesn’t cause postprandial BG fluctuations. With transition to a regular diet, reevaluate the alternate insulin source. For patients who aren’t critically ill but can’t self-manage their insulin pumps, the ideal choice is multiple daily subcutaneous injections. At minimum, such a regimen must consist of long-acting insulin and correction insulin doses. For optimal alternate insulin coverage, choose a basal-prandial insulin regimen, which consists of long-acting insulin, correction insulin boluses, and mealtime insulin boluses. Know that sliding-scale insulin as a stand-alone therapy isn’t an effective alternate insulin therapy for patients who’ve been using insulin pumps. It doesn’t provide continuous coverage and puts the patient at risk for DKA or HHS. If your patient’s pump has been removed and the only orders are for sliding-scale insulin, call the physician and obtain an order at least for long-acting insulin. Administer a long-acting insulin, such as glargine, NPH, or determir. This reduces the risk of a BG spike from a gap in insulin coverage. Similarly, when discontinuing alternate subcutaneous insulin, resume pump therapy just before the expected duration of long-acting insulin expires, if possible. For example, advise a patient who has been receiving glargine insulin to resume pump therapy 20 to 22 hours after the last glargine dose. Regular U-500 insulin, commonly called U-500, is ultra-concentrated (500 units/mL)—five times more concentrated than regular U-100 insulin. U-500 can be given in multiple daily injections. While not FDA-approved for use as CSII therapy, it’s being used off-label in insulin pumps. Patients taking it in a multiple daily injection regimen at home can use a special syringe with markings specific to the insulin concentration. However, many patients use regular U-100 insulin syringes, and insulin pumps can’t be calibrated to U-500 insulin. This necessitates increased patient awareness and safety checks. Ideally, an endocrinologist should be consulted if the patient’s receiving U-500 insulin. However, some hospitals may lack an endocrinology consultation service. If your hospital has a policy on U-500 administration, always refer to it. Otherwise, consult a pharmacist when a patient is admitted with U-500 insulin, whether given via a pump or multiple daily injections. In hospitals, U-500 syringes usually aren’t available. To reduce the risk of medication errors, your hospital may send syringes prefilled with U-500. Prefilled syringes should be labeled with the dose in volume and units. The order should be recorded in the medical record the same way, and all U-500 doses should be independently double-verified. Like regular U-100 insulin, U-500 insulin has a short onset—usually 30 to 45 minutes. Due to its ultra-concentration and extended subcutaneous-tissue absorption time, it has a longer duration. This pharmacologic profile gives it a biphasic effect, allowing it to act as both prandial and basal insulin. When administering U-500 by multiple daily injections, give it one to three times daily with meals. Most patients start with one daily dose, with subsequent doses added as the dosage is titrated upward. Be aware that because bolus settings are ratios, you’ll need to divide by five to obtain the U-500 dose. If the carbohydrate setting is 1 unit for every 15 g carbohydrate, the patient’s actually getting 1 unit for every 3 g carbo­hydrate. As you’ll recall, Beth in our opening scenario was admitted for a possible GI bleed. Most likely, she was dehydrated and producing stress hormones, which increased her BG level. The attending physician ordered removal of her insulin pump but didn’t order an alternate insulin regimen that provided continuous insulin coverage. Instead, after the pump was removed, Beth received sliding-scale insulin with rapid-acting insulin given at meals and bedtime—with no long-acting insulin for basal coverage. The switch to an intermittent insulin regimen left her without adequate insulin coverage because it didn’t prevent BG fluctuations. Lacking a continuous insulin source, she lapsed into DKA. Instead of removing Beth’s insulin pump, the hospital team should have considered whether to allow her to continue insulin pump therapy in the hospital. If they had, they would have realized she was a good candidate to stay on her insulin pump, as long as her BG was monitored closely for the first 24 hours to ensure pump settings were providing adequate insulin coverage. (Patients without oral intake should be monitored at least every 4 to 6 hours.) Because Beth wasn’t critically ill, a basal bolus insulin regimen would have been the best option as an alternate regimen after her pump was removed. While she remained on NPO status, she would need only basal insulin and correction coverage; she wouldn’t need mealtime boluses because she wasn’t consuming carbohydrates. Remember—all patients who’ve been using insulin pumps need continuous insulin coverage, whether they receive it from a pump or an alternate source. Without a continuous insulin source, they’re at risk for hyperglycemia and consequential illness. By increasing your knowledge of CSII therapy, you can help provide safe passage for hospital patients using insulin pumps to self-manage their BG—and serve as an advocate for these patients. At the time this article was written, Julie S. Lampe was a diabetes clinical nurse specialist at the Orlando Regional Medical Center, Orlando Health, in Orlando, Florida. Bhatt D, Reynolds LR. Keep your hands off my insulin pump! The dilemma of the hospitalized insulin pump patient. Am J Med. 2015 Jun 4. pii: S0002-9343(15)00461-1. Boyle ME, Seifert KM, Beer KA, et al. Guidelines for application of continuous subcutaneous insulin infusion (insulin pump) therapy in the perioperative period. J Diabetes Sci Technol. 2012;6(1):184-90.